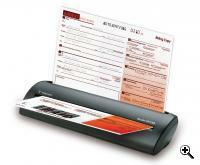 Fujitsu recently came up with the innovative ScanSnap S300 portable scanner. 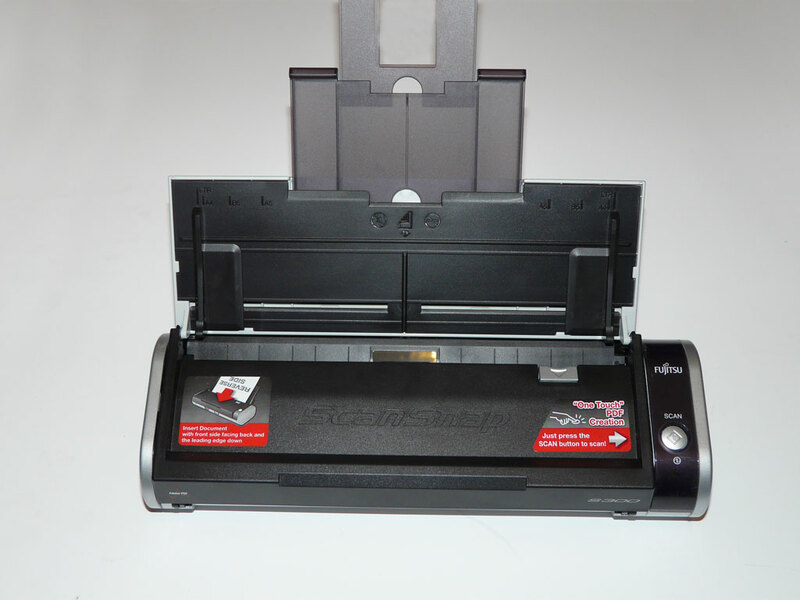 TFOT tested the mini-scanner extensively to see if its slim design and duplex capability can actually make this tiny automatic document feeder the scanner of choice for the professional road warrior. 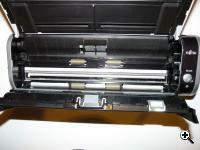 We received the Fujitsu ScanSnap S300 portable scanner in early 2008. The S300 is one of several portable scanning units currently available on the market, made to increase the productivity of the road warrior while still maintaining high-level scanning for office applications. The ScanSnap S300 is a very friendly, simple device in terms of is construction. The unit has only one button, which starts the scan going directly into the computer. At 3.08 pounds (1.4 kilograms), the S300 might not be the lightest, or smallest, device of its type, but it’s portable enough so that most people can carry it along with their laptops if they need to; and for its size, it’s defiantly the smallest automatic document feeder (ADF) with duplex capability in the world. 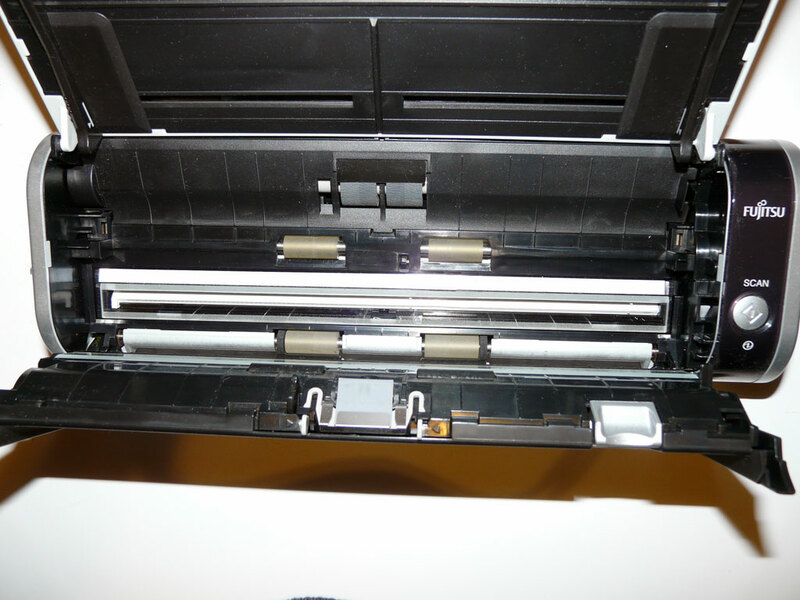 The S300 turns on when you open its cover, which can be extended to support longer (A4/letter) pages. Sadly, Fujitsu neglected to add a retractable tray to collect pages after they have been scanned, but putting the scanner in the middle of a table solves this, and we easily improvised cardboard to do the trick. Although this is more of an in-depth review than a comparative one, it’s still worth mentioning that there are several somewhat similar (and a few less similar) portable scanners on the market today at roughly the same price, around the $300 mark. A few notable examples are Visioneer’s Strobe XP 220 and XP 300, both lighter than the S300, with the latter capable of duplex scan and an even snappier scan time than the S300 but no ADF. Another is Plustek’s MobileOffice D28 Corporate, which boasts an incredible six seconds per page and, at 2.1 pounds (0.95 kilograms), is lighter than the S300; but it too does not have an ADF, which means that you will have to manually feed the scanner each page (not a big problem if you scan one page but pretty annoying if you’d like to scan a few dozen). 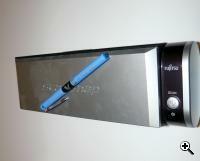 A completely different solution comes from Planon, who created the DocuPen RC800, which allows you to scan a full page by passing a nine-inch pen-like scanner over it, resulting in a 400dpi image that is stored on a microSD card and can be transferred to a computer. Although the DocuPen RC800 is an innovative concept, it’s not a direct competitor of the S300, being a hand-held scanning device more suited for an occasional page scan than for use with a real portable office. 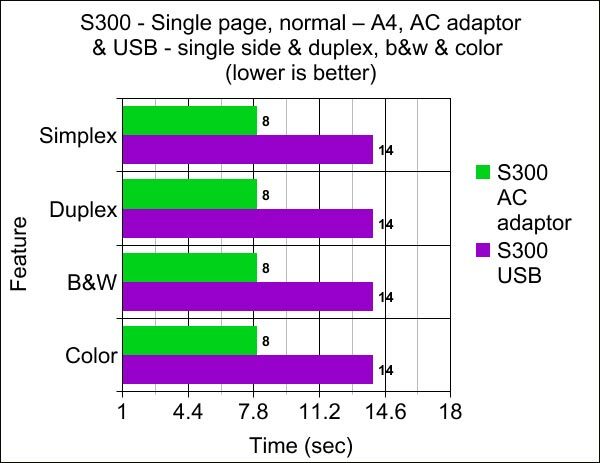 Unlike all of the devices above, the S300 has an ADF that can hold up to 10 pages at a time. In our testing, this proved to be a very important feature for real day-to-day use, and the fact that you can load a bunch of pages, go out for a minute or two, and come back when the work is done is a tremendous advantage. The software package that comes with the S300 includes several applications, such as the ScanSnap Manager, ScanSnap Organizer, and CardMinder, intended to help users organize their scanned documents, pictures, and business cards. Unlike many instances where an otherwise decent piece of hardware is crippled by poor software implementation, the software package that comes with the S300 is pretty solid though somewhat limited. The ScanSnap Manager, used to tune the various settings of the S300 and perform the scan, is a fairly straightforward, no-nonsense utility. For the average businessperson, the fairly limited nature of this utility could actually be a blessing, as the software can scan and convert a document into a PDF file with the press of a single button either on the computer or on the scanner. This one-click-to-PDF feature worked flawlessly in our tests and could make some people’s life a lot easier. On the other hand, for the power user, the simple nature of the software might not be so appealing. The only file format that can be saved is a JPEG, and only when scanning in “color” mode. The ScanSnap Manager doesn’t have any of the normal features you might find on your average flatbed scanner, such as color adjustment, sharpness, or even resolution (although there are four predefined resolutions). 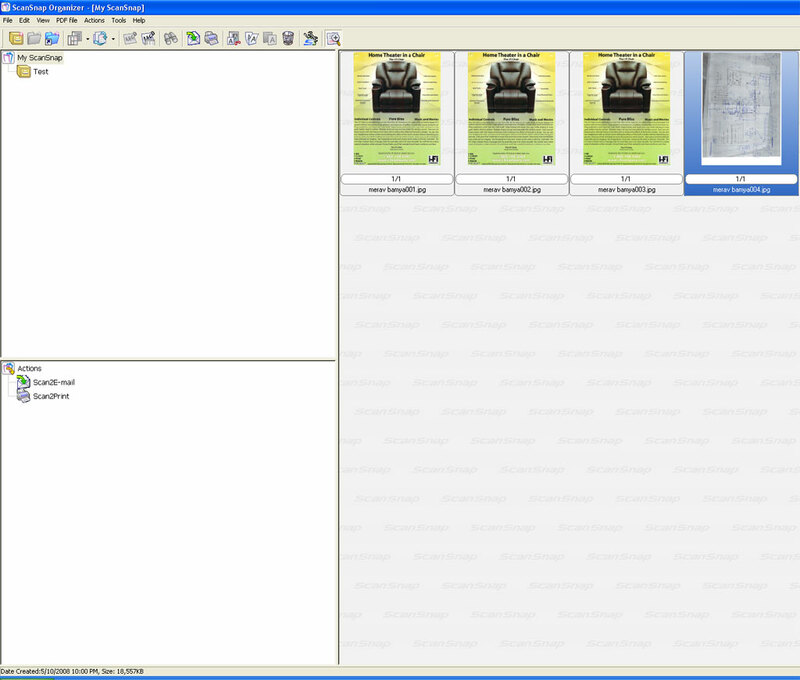 The ScanSnap Organizer software comes with the S300 and functions, as its name implies, as an image and document file organizer. This software is a nice addition but surely not a necessity since users can decide on their own which image-organizer utility to use once the image had been scanned and saved on the computer. Nevertheless, the ScanSnap Organizer worked well for us as long as we didn’t experiment with JPEGs too much—this is why they invented Photoshop. Other functions of the software, such as scan-to-print, scan-to-folder, and scan-to-e-mail, seemed to work flawlessly in our test, although scanning business cards to print them seems to require fairly high DPI to get a readable result due to the small letters. Business-card scanning in general is a whole different subject, and since it involves optical character recognition, or OCR, we will cover it in more detail in the following section. In general, we can say that Fujitsu supplied the S300 with fairly useful and simple-to-use tools specifically aimed at the traveling businessperson. We did find the lack of TWAIN support a bit of a downside, as it could have made this otherwise superb product even better and more appealing to a larger audience. We can only hope Fujitsu will release a TWAIN driver for the S300 in the not-too-distant future. The S300 software has two features based on optical character recognition (OCR): the ability to turn PDFs into searchable PDF files, and business-card data recognition. When we first tried the searchable-PDF function, we ran into some trouble. Apparently, Fujitsu didn’t program the software to change the output-file format of a document into PDF whenever the searchable-PDF format is chosen. Since our previous scanning format from earlier testing was a JPEG, the software did not know what to do and crashed several times. Eventually, we changed all the settings and fixed the issue, but Fujitsu could have saved us some time by using some common sense when creating the software. From our testing, creating a searchable PDF using various documents in English resulted in very acceptable searchable files. Searchable PDF files are slightly larger (a few hundred kilobytes more), and using Adobe Reader we were able to search words all across the document with pretty good accuracy. 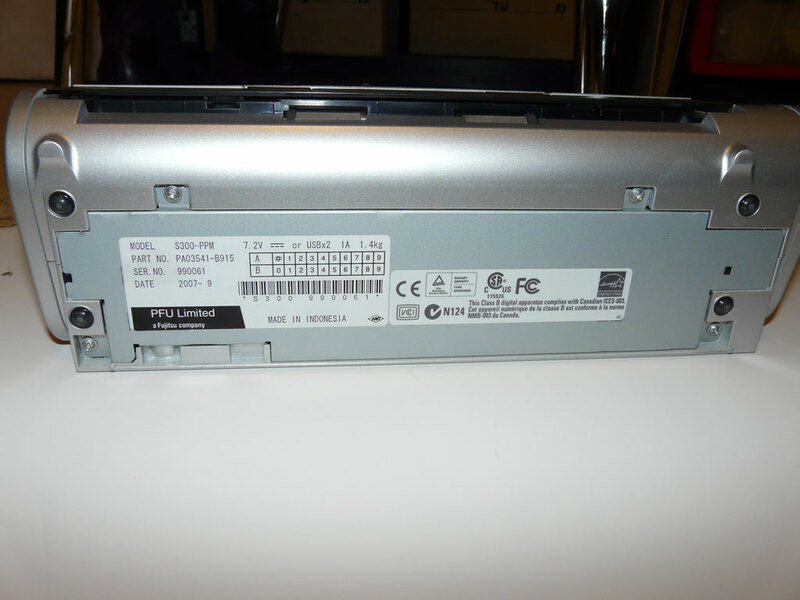 The S300 uses ABBYY FineReader’s OCR engine; however, Fujitsu chose the now-outdated version 7 (in March 2008, ABBYY released version 9—more on this in the interview). This older version resulted in problems when trying to OCR text with “subnormal” contrast (for example, white text on a green background, instead of black text on a white background, which worked fine, or even black text on green background, which also worked O.K.). The severity of this OCR contrast problem was especially apparent in the second feature that uses the OCR engine: the business-card scanner utility, called CardMinder. We had a chance to scan close to 200 business cards we brought back from such exhibitions as CES and CeBIT. Between 70 to 80 percent of the scans produced accurate results, with names, e-mails, addresses, and phone numbers correctly recognized by the OCR engine; the remainder were either only partiality recognized or not recognized at all. It is our understanding that the contrast issue is again the reason for the problem, and business cards with nonstandard backgrounds or colors (usually non-white background) resulted in poorly recognized text. According to Fujitsu, this contrast issue is a well-known problem with OCR software. However, this isn’t exactly the case—using a simple HP 6110 multifunction device and Nuance OmniPage Professional 14 (again, not the most up-to-date version), we were able to scan and successfully OCR three business cards that were not properly recognized by the S300 software. Given these results, we can say with confidence that if Fujitsu would have used a better OCR solution, it would be possible to successfully recognize more than 90 percent of the business cards we tested, making it an indispensable business tool. To sum things up, we feel that we have been a bit too harsh on Fujitsu in this section. The searchable-PDF function worked very well for the most part, it is a very useful tool for day-to-day office work, and the business-card software is a nice addition that worked flawlessly with Microsoft Outlook 2003 (we transferred all the data with the press of a button). It would have been even nicer to have a better OCR engine, which would reduce the need to check every business card for OCR errors, but given the $500 retail price of the OmniPage software—and the $250–$300 price tag of the S300—what Fujitsu is offering is completely acceptable. Paper Chute Capacity: Maximum 10 sheets (A4 size at 20 lb. or 80 g/m²). We will divide our tests into two parts: scanning speed and scanning quality. There is no doubt that speed is one of the strongest sides of the S300; the ability to scan a dual-sided color A4 page in less than nine seconds is truly remarkable by any standards. We ran almost any conceivable combination of options on the S300, ranging from multiple pages, different scanning modes (200dpi–600dpi), simplex and duplex, and paper sizes (from A4 to business cards and pictures). On our first test, we wanted to see how long it would take the S300 to scan 10 single-sided black-and-white A4 pages of text at each of its quality levels. 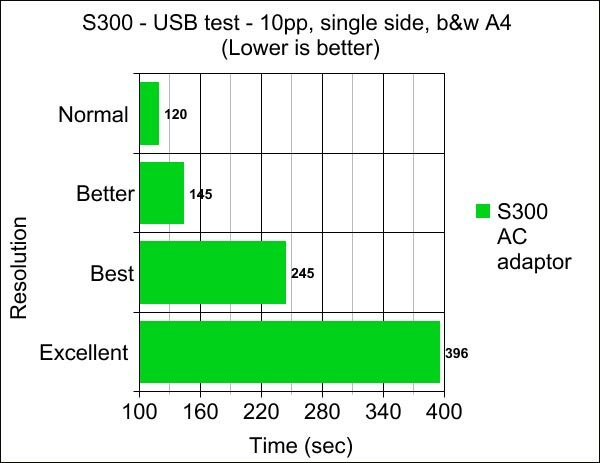 As you can see on the graph, the results were very good: on the lowest resolution, the S300 managed to scan just over 10 pages per minute—better than what Fujitsu claims on its website. Better resolutions obviously require longer scan times, and the relation seems to be proportional: twice the resolution equals twice the scan time. However, going from best to excellent (600 dpi) takes considerably longer time and consumes more hardware resources (although on our AMD 4200X2 desktop with 2GB of RAM, this was not noticeable at all). 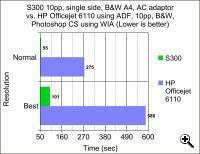 This is not supposed to be a comparative review, but we did throw in two test scans of our old Hewlett-Packard Officejet 6110 using ADF. 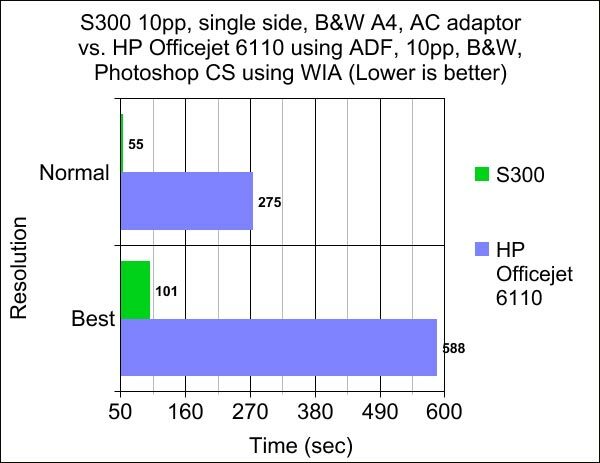 Needless to say, there is no comparison between the scan speed of both devices, as the S300 can scan almost as fast at its maximum resolution as the HP at its lowest. On our second test, we tried the same black-and-white single-sided 10 pages, but this time using the USB connection instead of the AC power adaptor. The results are obviously slower (about twice as slow, except using Excellent setting, which was remarkably similar) however they are still very acceptable and anybody who is considering doing a few scans using laptop battery power should still be able to get a very practical scanning times. 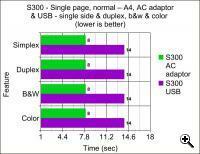 In our last speed test, we were trying to determine how the S300 handles duplex and color images. The results were very surprising, showing that, using both the AC power adaptor and USB, there was no measurable difference between scanning black-and-white or color images, as well as duplex or simplex pages. Our second set of tests had to do with the quality of the S300 scans. We should start by stating that what the S300 isn’t, and was never meant to be, is a professional image scanner. Spending $300 on a portable ADF scanner will not buy you anything even close to a professional portable image scanner (if such a thing is even possible). 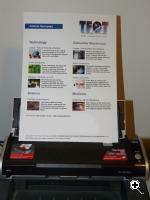 The S300 was created for office work, scanning text and the occasional brochure or presentation. This probably the reason why it is so limited in terms of output options (PDF as a main output file and JPEG for color scans), as well as the reason for the lack of TWAIN support (although we still feel Fujitsu could have gone the extra mile on this one). From our testing, we found out that scanning in color mode/JPEG (even when the quality is set to Normal) resulted in a much more readable and clear text, and since the scan takes the same time as a Normal, B&W–setting scan, we recommend using it as a default. The only problem is that in this mode, we lose the option of creating a PDF using the software. It is of course always possible to use an external application to create a PDF, but this is a much more cumbersome solution, and most users who will purchase the S300 for scanning office papers on the go will probably prefer minimum hassle. Setting the quality to Excellent (with color and JPEG settings the same as before) resulted in very crisp text. Using B&W and PDF as output resulted in an improved output quality (when compared to B&W and PDF at normal), but PDFs in general seemed to result in a somewhat lower quality than JPEG. Anything below Best (color and JPEG) resulted in distorted colors and fairly poor image quality, and unless quality is not really important, we can recommend using Excellent for any type of color picture. Color reproduction on the S300 was fair—it was actually much better than our old HP, but we would not recommend it for much beyond office work. Our biggest complaint when it came to quality was the appearance of vertical lines in some of the color scans, which were usually not apparent in the B&W text scans. These are caused by either a malfunction with our specific S300 unit or more probably dirt on one of the internal parts of the scanner. Cleaning the device did help a bit, but the problem returned again and again. This could be one of the reasons why portable ADF scanners are rare—they are just too damn delicate. To sum things up, despite the annoying vertical-line issue (which may or may not be specific to our test unit), the S300 preformed very well, doing what it was built to do: quickly and easily scan office documents. Anything beyond that requires using the scanner’s highest resolution, and even then it is not a replacement for a decent flatbed scanner. At the end of the day, the S300 is the closest thing we are aware of to being the ultimate portable scanning device. It’s extremely fast, has literally no start-up or warming time, and produces good scans on its maximum resolution (600 DPI) and decent scans on the lower ones. 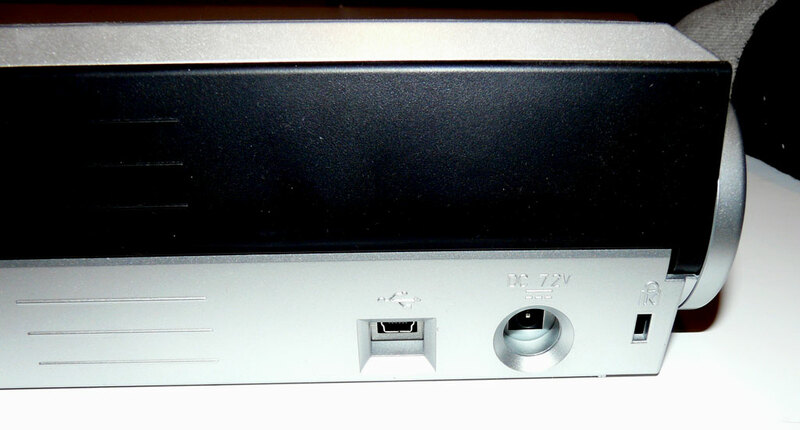 It has an extremely useful duplex capability and an even more useful 10-page ADF. The S300 is very simple to install and use, and the one button to PDF feature is a great addition for increased office productivity. The business-card scanning feature works very well and, at 80 percent accuracy, the bundled OCR is not perfect but its ease of use and simple integration with external software such as Microsoft Outlook usually compensates for that. Although the S300 is not the smallest or lightest portable scanner currently on the market, its electric flexibility, being able to connect directly to a laptop with 2X USB instead of a power outlet, gives it an advantage. In terms of cost, the S300 has a very reasonable suggested retail price of $300, which again isn’t the cheapest on the block but, given its quality and duplex capability, seems more than reasonable. There are a few issues with the S300, and at least some of them are potentially fixable through future software updates by Fujitsu. We have mentioned in previous sections the lack of a TWAIN driver as well as the problem to OCR business cards with non-white backgrounds. 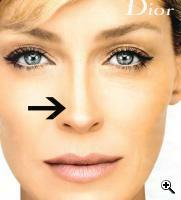 Another issue we ran into was the vertical-line problem when scanning in color at a high DPI. This issue is probably either due to accumulation of dust inside the scanner or due to some specific issue with our test unit. Here at TFOT, we always feel free to dream about the perfect device, and besides resolving all those minor software issues there are still a few things on our wish list that we are hoping to see on the next incarnation of the S300. Although the S300 is perfectly portable as it is in terms of size, weight, and power, it still requires a PC to operate. A truly portable device will be able to scan documents without a computer at all and store them on an internal flash memory or even a removable flash card. Such a device could even connect directly to a printer, just like a digital camera (using Pictbridge), and print scanned pages, making it a portable mini-photocopying device. Such a future device could also come with a built-in removable battery that could be used when no power is available and be removed for reduced weight in other cases. Maybe the only reason we don’t see ourselves completely abandoning our old office multipurpose scanner in favor of the S300 is the lack of book-scanning capability. There are all sort of solutions on the market for (relatively) portable book-scanning devices, but if Fujitsu ever comes up with a version of the S300 that can scan book pages as quickly and easily as it currently scans documents (combined with the no PC capability we mentioned above), it will no doubtcreate one of the most perfect student tools ever devised. Bottom line: the S300 is possibly the best portable scanner around. If you are a business person doing a lot of traveling and in need of some quick and easy access to a document scanner, or even if you are a home or small-office user who doesn’t need all the functions of a multipurpose device and want to conserve precious desktop space while still having a no-nonsense, high-quality, fast scanning device, the S300 will suit you perfectly. 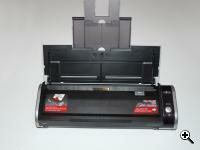 If you do need to scan books, or if you require such professional features as ultra-high quality, perfect -color reproduction, and slides scanning, we suggest you stick with a multipurpose or a professional flatbed scanner (and possibly purchase the S300 as a fast and portable, document-only back-up scanner). TFOT recently conducted an interview with Michael Sidejas, product manager for ScanSnap at Fujitsu, in order to learn more about the S300 and the company’s plans for the future of mobile scanners. 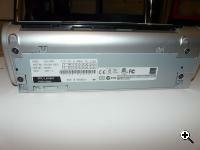 Q: How was the Fujitsu S300 born? A: The Fujitsu ScanSnap line of scanners was first introduced in 2003 with the idea of taking the complications out of document imaging and bringing the utility down to every business user with one-touch, ease-of-use scanning. ScanSnap combines performance and affordability in a small form factor, to offer duplex, multi-sheet scanning to every one from home and small-business users. Expanding on the success of Fujitsu’s first ScanSnap scanners and responding to customers’ requests, the natural progression was mobile scanning. 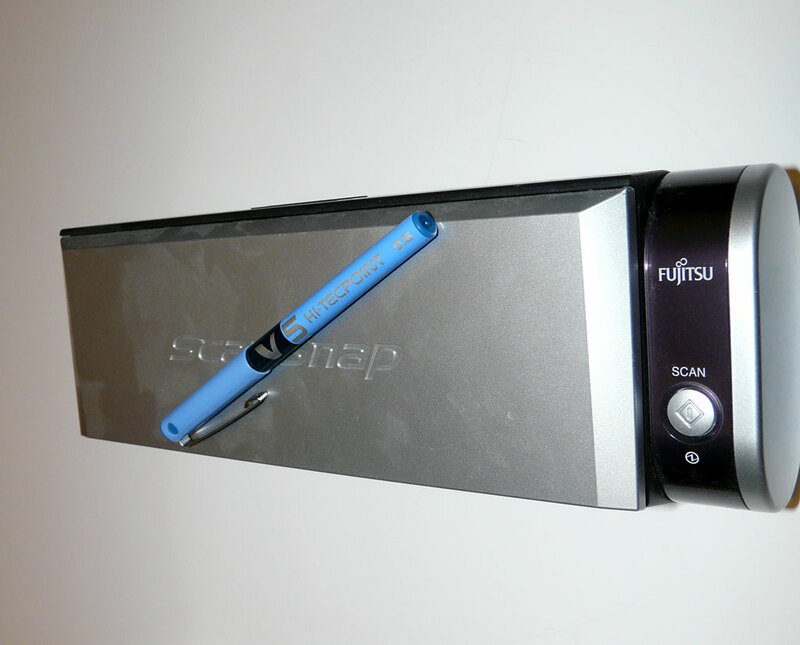 Fujitsu’s first mobile scanner, the ScanSnap S300, was born. The mobile device continues to exceed expectations and address the common pitfalls apparent in flatbed scanning, offering a compact scanner at an affordable price that doesn’t compromise speed or performance. Q: The scanner market has undergone a revolution in recent years—after the initial success of stand-alone scanners in the late 1990s and early this decade came the multifunction devices that in the space of only a few years decimated most of the stand-alone-scanner market, except for the high-end professional units and a small number of portable units (like the S300). Do you see this trend continuing, or do you see a return to the stand-alone tradition in the home/office market in the next few years? A: It’s hard to say at this point exactly what’s going to happen. Multifunction products (MFPs) didn’t really decimate stand-alone scanners, but rather the technology was incorporated into the MFP. It was an evolution of sorts, and certainly a proof point of the technology that powered stand-alone scanners. While MFPs have found their function and utility in business applications, they don’t really live up to their expectations in terms of imaging. Contrary to that, the ScanSnap S300 isn’t a jack-of-all-trades, like the MFP, but rather a master at delivering high document-imaging results. It’s hard to tell just yet what the portable and stand-alone scanners have in store in the months and years to come. There are a lot of dependencies to understand before really etching out the market. When there is one dedicated device for all of your needs—printing, copying, scanning, and faxing—it becomes difficult to be the best in class in all of those areas. So, while the MFP market may continue to evolve its scanning capabilities, it still needs to balance all of the other functionality. Q: Are you considering a portable scanner that does not at all require a computer and can store scanned documents on an internal storage device (and could even be connected directly to a printer to produce copies, like a digital camera)? A: We’re always looking for opportunities to evolve our product line, but there is really no telling if that’s the direction of innovation we’re going to take. Fujitsu is the leader in the document-imaging space, so as technology continues to innovate, we’ll be a part of it. There are exciting things to come in the future, for sure. We’re just not sure the stand-alone portable scanner will be driving the changes. Q: Are you going to add TWAIN support for the S300? A: At this time, we don’t have plans to add TWAIN support to the S300. We have a number of scanners in the workgroup and departmental segments that offer TWAIN support, but the S300 will likely continue to run off the proprietary driver. When we began exploring the possibilities of bringing the advanced functionalities of our workgroup scanners down to a broader audience, our primary focus was to provide ease of use and flexibility so that anyone could easily operate the scanner. To do that, the most sensible formula was to run the ScanSnap off a ScanSnap driver. The ease of use and advanced functionality has been a great success across our small business and small-office and home-office customers. Q: Are you planning to release a version of the S300 with updated OCR software? A: Fujitsu keeps up with the latest versions of ABBYY FineReader that are released. However, because the software rolled into the ScanSnap scanners are specific to the devices, the version numbers will be different then the latest versions released by ABBYY. The third iteration of ABBYY FineReader for ScanSnap is integrated into the ScanSnap S300, and we’ll continue to keep up with the new versions designed specifically for the ScanSnap. Q: Our test unit produced some scans with vertical lines. Cleaning the unit helped, but it seems to occur each time we use high-res color scans. Is this a known issue with ADF scanners or maybe an issue with our specific test unit? A: Colored lines are the result of paper dust, un-fused toner, and other particle contamination that transfers from documents passing through the feeder and accumulating on the glass covering the cameras. In most cases, using isopropyl alcohol and a lint-free cloth (like those used for lenses) can reduce or eliminate this interference. You can use Fujitsu’s F1 cleaner or you may purchase an equivalent, such as purified alcohol at 91 percent or better. (Do not use 70 percent rubbing alcohol, window cleaner, or other standard glass or countertop cleaners). Q: Why did we receive better results when scanning a text document to JPEG than to PDF? A: The ScanSnap’s optics is oblivious to the format selected by the operator. PDF and JPEG are different formats and use different methods in producing digital content. These differences impact many things, including the visual appearance of the image as well as the overall file size of the data, to name just a few. You can alter the resolution and compression values for JPEG and PDF through the ScanSnap Manager (and even further with Adobe Acrobat for PDF), but they are subject to the virtues or limitations imposed by their respective format. 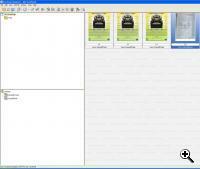 Q: Is there a way to attach the scanned image of a business card and export it to Outlook using the CardMinder? A: CardMinder does not export the image data into Outlook 2007, only the index field information. Fujitsu is investigating this feature for future product iterations, but at this time it is not included. Q: Is there a Vista 64bit driver for the S300? A: If you’re asking weather it’s compatible with 64 bit Vista, then yes it is. If you’re asking if it is using 64 bit for processing—no, it isn’t. It’s running on 32 bit for processing. Q: Where can you go after the S300? A: Well, time will certainly tell. As mentioned earlier, a lot will be dictated by the evolving technology. Document imaging doesn’t really require higher-resolution, so we’re not sure it will be the focal point of our next waive of innovation. But we’ll continue to keep a close pulse on the industry and what our customers are asking for, and create solutions that will address the changing needs.